At WannaB Inn, we strive to provide equal access to our accommodations for all, including those with disabilities. Due to the original date of construction of our facility, some features may not be available for assistance with all disability needs. Please carefully review the listed features for your desired room selection prior to confirming your reservation. Our friendly Reservation Specialists will be pleased to assist you. They can be reached at 941-474-3431 Monday to Saturday, 8 am to 6 pm and Sunday 9 am to 5 pm, Eastern Standard Time. 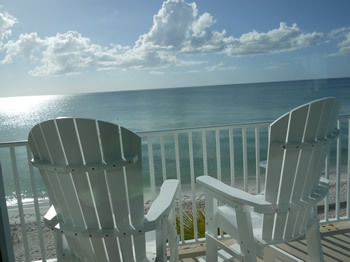 Seastar Motel & Villas is located in the southern-most part of the resort on the Gulf of Mexico adjacent to Stump Pass State Park. 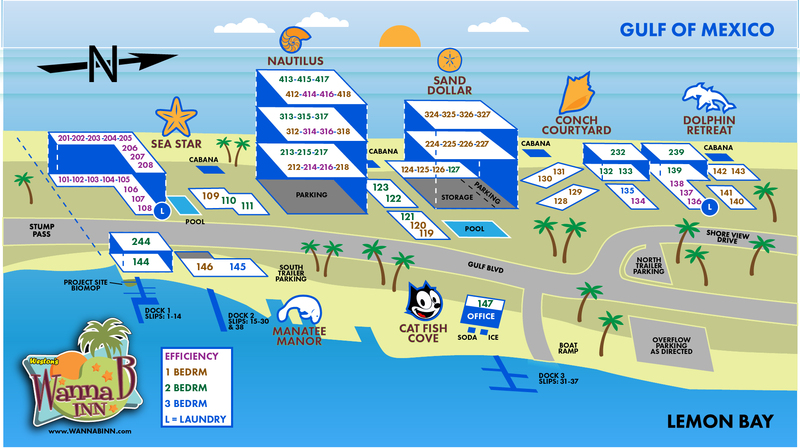 There is a beautiful temperature controlled pool located between the Sea Star Villas and the Sea Star Motel. The Nautilus is a 4 story building which features two-bedroom units facing the Gulf and one bedrooom and efficiency units facing the bay. This building is the newest and visitors love the spacious and airy accommodations. Sand Dollar Circle is the building which features our whimsical brightly colored clock tower. There are 12 Gulf front units on three stories. 11 are one bedrooms and 1 is a two bedroom. A beautiful pool on the east side is bordered by five "Old Floida style - cottage type units. 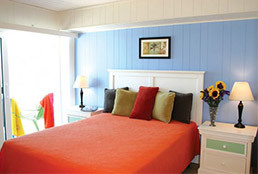 Conch Courtyard features a charming array of vintage cottage-style units that are all brightly painted. This is a favorite of family reunion groups due to the variety of accommodations and the proximity to the cabana and beach. Dolphin Retreat is located in the northern-most area of the resort. There are three studios and two one bedroom units surrounding a courtyard and two two-bedroom and two one-bedroom units on the beach. Although these are among the oldest units, they have been updated and are gentle reminders of simpler days. Manatee Manor is located at the southern end of the resort on the bay side. A duplex has two units - both two-bedrooms. Unit 145 is a 3-bedroom 2-bath house with a beautiful view of Lemon Bay. It features a large kitchen and an open dining and living area. There is an adjoining 1-bedroom unit which can be opened up to the house if so desired. Our two southern-most docks are located behind these buildings. Catfish Cove is the location of the office, boat ramp and Dock 3. There is also a simple two-bedroom unit which is often requested by our longtime guests. We suspect it is the easy access to the dock for terrific night fishing that draws people to Unit 147. If you are visiting us for the first time, your are welcome call our office and one of our helpful reservation specialists will help you to select the place that is right for you. 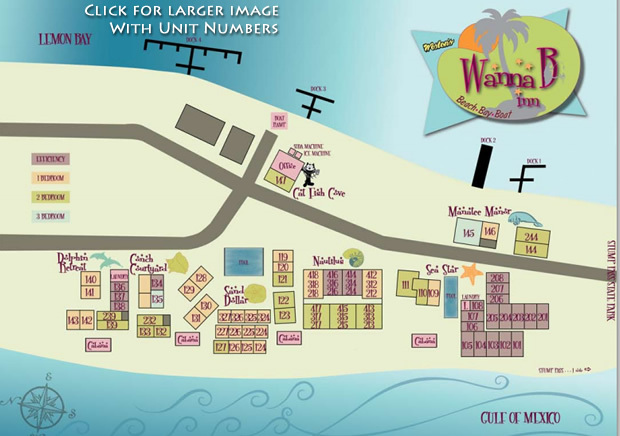 The map below will give you an overview of the site. Click on it to see a larger, printable version. Please provide us with your details, your questions and/or comments and we will follow up with you shortly. Thank you!